This video is a bit longer than normal, because I wanted to show you how the paper mache clay is added to the armature of the elephant sculpture, and how you can add textures to the clay. The elephant sculpture in this episode is obviously a lot smaller than the baby Asian elephant I made a few months ago. He was also a lot easier to make. The size isn’t really an issue, since larger sculptures simply take more time to do – they aren’t necessarily harder to make. The big improvement was the paper mache clay. The bigger sculpture was covered in many layers of traditional paper mache strips and paste, and each one needed to dry. Then I had to form the features, and cover them with another layer of paper. And lastly, the wrinkles had to be added with one last layer of paper strips and paste (because it isn’t an elephant without wrinkles!). 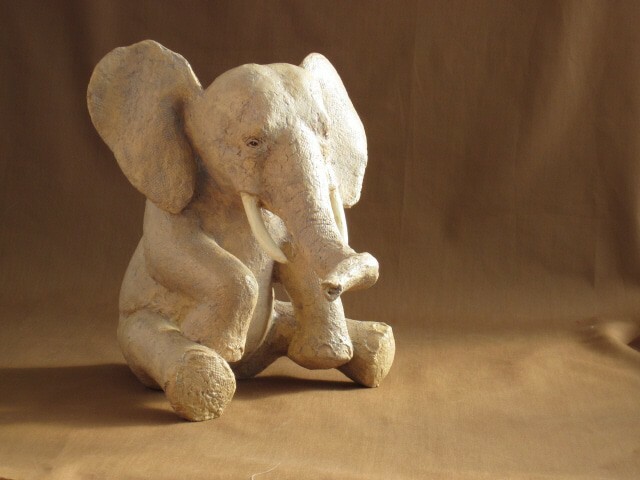 The small elephant was made with only two layers of clay, as you see in the video, so many of the steps were eliminated. And the clay itself covers any irregularities in the underlying armature. Way easier. And more fun. On a slightly unrelated note, I found out yesterday that my paper mache clay butterfly tutorial is being put to good use. Models are being made to show the life cycle of butterflies, and the finished models will be on display at the State Arboretum in Virginia. I’ll post a link so you can see photos that show how they turned out as soon as I hear back from them. My elephant is 32 inches long and 28 inches high – but you can make your elephant any size you like. And yes, sculpture does take a lot of practice. You wouldn’t believe how many of my attempts end up in the garbage before anyone sees them. But that’s part of the learning process – if you don’t make any mistakes, you aren’t learning anything. where can i find the sitting baby elephant armetures? thanks! Where can I get the baby elephant (the mini ones that are in the sitting poses) where can i get the armetures? the skeletons for the clay? also what brand of joint compound do you use? (i live in the u.s) i want to make a sculpture for a snow globe for my friend who loves elephants but im an amature and know i need some help with it. thanks! love your sculptures!!! Hi April. The pattern for the sitting African elephant is in my book. You could also check out the pattern for a full-sized baby Indian elephant, which is here (scroll down the page for the link to the pattern), and then change it to a sitting position. And make it a whole lot smaller, of course. There aren’t any pre-made armatures for elephants, as far as I know. I like to use the Sheetrock brand of joint compound. Your work is so amazing, I love getting your emails, so inspiring! Thank you soo much, i needed to make a elephant for my book report project and this gelped me lots!! Thanks for sharing your idea expertese with us,am so pleased to learn from you as l am a new art student,finding idea this days has been a llot problem,as the legends of art shadows rest artist.l do hope you have advise for me.thanks once more. Thanks, Carly. You have a nice website, by the way. How exciting, that your clay recipe is germinating across the web already! My bad. I checked the wrong doohicky at YouTube. Please refresh the page – it should work now.